MSNBC‘s “Breaking News” on Twitter, @breakingnews, is reporting that lawyer, civil rights activist, and politician, Georges Anglades, was killed in the Haiti quake. Anglades and his wife are pictured here. Anglades was born in Port-au-Prince in 1944, educated in Haiti as a lawyer, and received a Ph.D. in Vienna. Anglades came to national attention as an outspoken critic of the Duvalier regime in Haiti. From 1957 to 1971, Haiti was ruled by the autocrat, Dr. Francois “Papa Doc” Duvalier, whom it is estimated ordered the deaths of 30,000 Haitians and exile of thousands more. You can link to a Wikipedia article about Papa Doc Duvalier here. Papa Doc Duvalier’s reign was followed by his son, Jean-Claude “Baby Doc” Duvalier. Although he attempted to soften some of the harsher aspects of his father’s regime, “Baby Doc” Duvalier’s reign was marked by corruption and the continued oppression of any political resistance. “Baby Doc” Duvalier ruled Haiti from 1971 until he was overthrown by popular uprising in 1986. You can link to a Wikipedia article about “Baby Doc” Duvalier here. It was through this popular uprising that Anglades became part of the Haitian political landscape. He was made a political prisoner by “Baby Doc” Duvalier in 1974. Later, Anglades served as a Haitian cabinet minister and advisor to President Rene Preval. 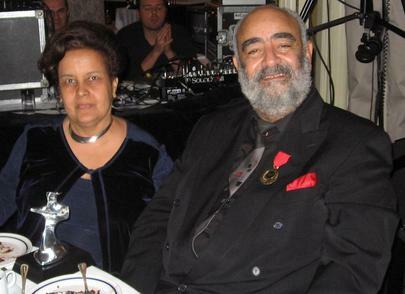 Anglades and his wife were both killed in the quake. In addition to the MSNBC BreakingNews report, you can link to an article about the couple’s death from Canadian news outlet, TheStar.com, here. As of approximately 3 hours ago, reports from Haiti are estimating that the death toll will reach 100,000. You can link to an article discussing the estimated death toll here. Describing the earthquake as an “unimaginable disaster,” Secretary of State Hillary Clinton assured that the Haitian death toll will reach tens of thousands. You can link to an article quoting Sec’y Clinton here. 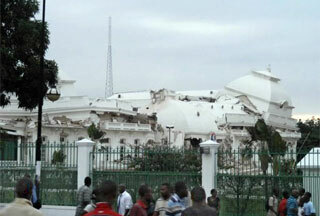 The damage done to the Haitian Presidential Palace is pictured below. This entry was posted in activists, civil rights, Disaster & Human Rights, International Law and tagged Activism, Add new tag, civil rights, earthquake, François Duvalier, Georges Anglade, Haiti, Hillary Rodham Clinton, Jean-Claude Duvalier. Bookmark the permalink.